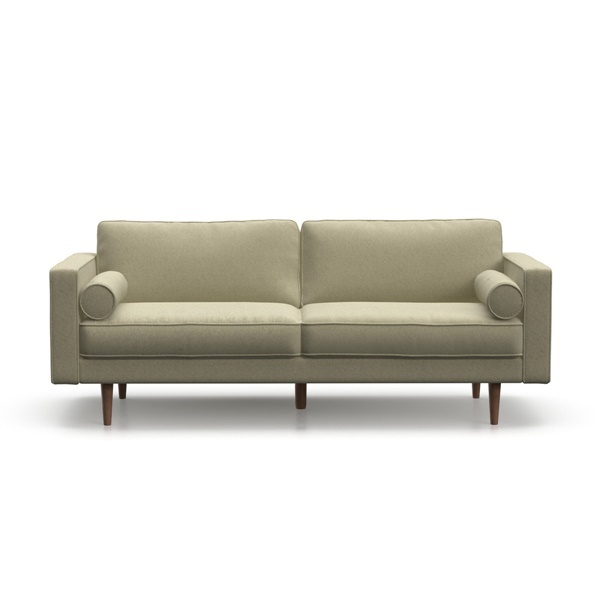 An eye-catching option ideal for the minimalist or modest-size space,the Lexi Sofa offers modern style with just the right vintage mid-century vibe. Up for grabs in a vast array of shades ranging from edgy to understated, the Lexi Sofa may be sleek and slender in silhouette but it's also satisfyingly stuffed with the comfort of lush memory foam. Interior cushions is topped with a layer of memory foam for extra comfort..
Includes two coordinating bolster pillows. LOVING IN LIME GREEN! A STYLISH SOFA! Happy with it! Many of our clients need to feel comfortable while waiting before seeing the doctor, I was told to find something comfortable, casual but also professional and modern enough for our waiting room, we've had it for two weeks and combined with a few other changes to the room, most of our patients seem more relaxed before their treatment - I highly recommend it! Don't be impatient like I was and order without getting fabric swatches first! The color wasn't an exact match to the photos and I found it looked even different because of the computer screen I was looking on - just want to put it out there! No kidding about the memory foam! Comfiest sofa I've ever owned! Great service & beautiful sofa!! Incredible quality, outstanding customer service especially since its my first time buying furniture from a website ! Really like the understated style of this piece. Bought it on a whim. Happy I did. No complaints. Happy customer. Went with the traditional charcoal gray color. It is a beautiful piece. All around great experience with Inmod. After seeing the new green color that seems to be a new trend, I was intrigued. I was in the market for a new sofa anyways and was tired of the boring neutral colors. I decided it was time to spice it up and chose the lime green color. It was exactly what my room needed. ProsColor is gorgeous and unique. Very happy with my purchase and I will most definitely be back to Inmod for my furniture needs. The cushions of the Lexi Sofa are going to have a firm feel, without sinking into the cushion.